The course is offered during the Winter 2019 session on Tuesdays from 2:30 p.m. to 5:30 p.m.
Watch the 2013 delegation video - winner of the NMUN-NY 2013 Video Contest! Model UN conferences bring together students from across the world to simulate sessions of United Nations bodies, such as the Security Council and General Assembly committees. Students represent different countries and advance their foreign policies, as they debate the issues and crises that face the world today. The Model United Nations course will cover a variety of subject matter, from development to environment to international security. 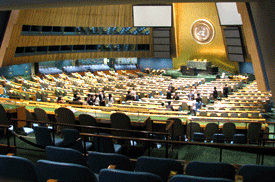 Students will learn about the UN system, a country’s domestic and foreign policy interests, and multilateral diplomacy. They will develop their research, analytic, public speaking, as well as diplomatic skills. The course is sanctioned by three university credits. Through participation in the in-class activities, students will gain understanding and experience of international diplomacy, familiarity with current issues, and confidence in their communication skills. To cap off the course, students will participate in the prestigious National Model United Nations conference, held in New York City in the spring. During this five-day simulation, delegates get the opportunity not only to meet students from around the world, but to debate in the UN General Assembly itself! Interested students are required to submit their candidacy no later than October 5, 2018. Candidates will be selected according to their experiences and knowledge that could be deemed useful to Model United Nations conferences. If you are selected for an interview, you will receive an email by October 19th, 2018. Only selected candidates will be contacted. You must apply to SCS 3195 by completing the online application form. If selected for the course, we will provide the registration form by email as of November 19th, 2018. The completed form must be returned in person at FSS 3001 or by email if the form is scanned (if you choose the last method, please make sure that the information is legible). Registration for this course is not possible through uOcampus. *Please note that for some students, this course could possibly count towards your program's optional courses (DVM, ECH, ECI, EIL, EPP, EPV, PAP, POL). The Faculty will handle the purchase of the bus tickets and medical insurance (mandatory). No other alternative transportation or travel insurance will be accepted. The departure and return dates will be the same for each student. This means that the entire class will travel together to New York. The travel costs are non-refundable. All student-delegates will have rooms booked at the Sheraton New York Hotel & Towers (hotel to be confirmed for 2019). Please note that all student-delegates will have to share a hotel room with two or three other class students. No exceptions will be allowed. Hotel costs are non-refundable. You must have a valid passport and must be able to travel legally to the United States. You are responsible for securing your passport and/or visa. You must have a valid passport before leaving the country as well as a visa if necessary. You must begin the process of obtaining these documents immediately once you are accepted in the course. You must provide us with a photocopy of your passport. If you are refused legal entry into the U.S., you will not be reimbursed the costs associated with NMUN. If you are a Canadian citizen, please consult the Passport Canada website for information on the necessary steps. If you are not a Canadian citizen, you are responsible to undertake the appropriate steps to consult your embassy or consulate to find out about your travel requirements and fees to the United States. Expenses for the trip are the responsibility of the students, and normally range around $1,500 CAD. Please note that the fee may vary. The total cost for the NMUN in New York will be confirmed in January. Please note that some dates may change. Deadline to submit application form and other required documents October 5, 2018 at 4 p.m.